Ship detection in heavy sea clutter is a big challenge for over-the-horizon (OTH) radar. Wideband signal is helpful for improving range resolution and the signal-to-clutter ratio. In this paper, to support OTH radar employing wideband in cochannel interference, we propose environmental sensing-based waveform (ESBW) strategy, by considering transmit waveform design as an active approach and cognitive loop for the time-varying environment. In ESBW strategy, OTH radar monitors the environment in real time, estimates interference characteristics, designs transmit waveform adaptively, and employs traditional signal processing structure to detect targets in the presence of interference. ESBW optimization problem employs the criteria of maximizing the output signal-to-interference-plus-noise ratio (SINR) of matched filter and similarity constraint for reasonable range resolution and sidelobe levels. The analytic solution to this constrained problem is developed, so that ESBW design algorithm’s efficiency is guaranteed, with adjustable SINR and autocorrelation function. A simulated scenario with strong interference and colored noise has been introduced. Simulation results demonstrate that OTH radar with ESBW strategy detects the target successfully in the background of cochannel interference. Sky-wave over-the-horizon (OTH) radar makes use of the propagation through the ionosphere and is capable of detecting targets at long ranges from about 500 to 3,000 km, accepted as effective wide-area surveillance sensors [1, 2]. OTH radar operates in the high frequency (HF) band (5 ∼30 MHz) where the external electromagnetic environment is space-time variant, surrounded by radio frequency interference (RFI) and atmospheric, cosmic, and man-made noise [3, 4]. Sometimes, OTH radar has to operate in congested bands which are densely populated due to the use of radio frequencies . For detecting slowly-moving vessels, OTH radar requires broader bandwidth than that in plane detection, since the Doppler shifts of ship echoes coincide within the spectrum range of sea clutter, which makes adequate signal-to-clutter ratio (SCR) essentially important for ship detection . Broad bandwidth reduces the range resolution of sea scatter cell size so as to improve the SCR . However, when OTH radar employs wideband signal, the broad-occupying bandwidth increases the possibility of encountering cochannel interference. To avoid cochannel interference, the frequency management system (FMS) is necessary in OTH radar for providing information on channel occupancy and noise level to select operating frequency [1, 3, 4]. Saverino et al. proposes a cognitive waveform technique of selecting waveform parameters, such as bandwidth, pulse length, etc., based on ‘available clear channels’ determined by the FMS. The best choice for OTH radar is to avoid cochannel interference, if possible. However, ‘avoiding’ may not work sometimes when there is no unoccupied channel with sufficient bandwidth at all. In this case, insisting on clear narrowband leads to reduced bandwidth and increased sea-clutter power. Alternatively, employment of occupied wideband does not worsen the sea-clutter. Meanwhile, it requires interference suppression or signal design. Interference cancelation algorithms have been proposed for eliminating cochannel interference in signal processing stage. Fabrizio proposes adaptive beamforming techniques in spatial domain [9, 10]. Suppressing interference in time domain and frequency domain fundamentally involves estimating parameters of interference and then suppressing, with iterative algorithm widely employed, like least-mean-square filters [11, 12] and orthogonal subspace projection filtering . Guo evaluates the interference cancelation performance of various schemes based on the minimum variance distortionless response (MVDR) criterion, in both time domain and Doppler domain . However, as Fabrizio points out, the performance of adaptive beamforming is highly dependent on spatial characteristics of interference and limited by the receive array. The mutual problem shared by iterative algorithms above is how to guarantee that the interference components are suppressed ‘enough’ while the information of targets is preserved. In Guo’s schemes, there is one requirement that interference training should be performed with ocean/ground clutter and strong target-like components excluded, which is a hard task in sky-wave OTH radar. Besides, for interference cancelation performed on received data, there is one potential risk that employing nonlinear algorithm too much in signal process may cause unexpected influences, e.g., degrading clutter visibility . Also, algorithms designed for suppressing narrowband interference are unsuitable for broadband interference or colored noise with diffused energy. Unlike passive cancelation, transmit waveform design is an active approach, capable of avoiding reserved bands occupied by interference inside the transmit band. One example is disjoint spectrum waveform (DSW), however, giving rise to high range sidelobes which cannot be suppressed by traditional spectral weighting. Thus, DSW design is necessary, to balance desired spectra with low sidelobes. Transmit and receive waveforms are designed separately in . SCAN (stopband cyclic algorithm new) and radar-centric design are proposed in [16, 17]. However, DSW design algorithms do not work in an adaptive way. Also, it is a problem to define stopband for DSW design in practical application, especially in the presence of colored noise with spreading spectrum. Adaptivity is important for waveform design in OTH radar due to the time-varying environment. This makes environmental sensing essential, to design waveform in a cognitive way. Cognitive radar is introduced for the first time by Simon Haykin in . In our previous work , cognitive OTH radar (COTHR) is proposed for better frequency management and multiple-task performance. Herein, we consider employing cognition in wideband signal design in the background of cochannel interference. 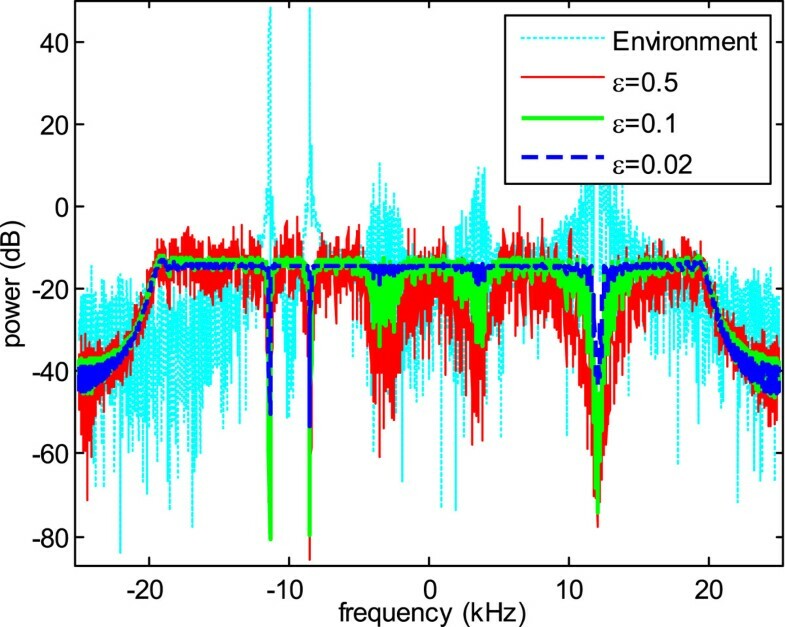 Researchers have developed waveform design methods in colored noise with known statistical properties, under certain characteristics requirements, mainly involving constant modulus and autocorrelation function (ACF) [20–22]. Numeric techniques and iterative algorithms are necessarily employed for this non-linear constrained waveform optimization. Motivated by Sussman’s work , similarity constraint forces the sought-after waveform to be close in a certain sense to a desired waveform for reasonable ACF . Similarity constraint in the infinity norm is employed in phased code design [24, 25]. Similarity constraint in Euclidean norm is employed for robust receive beamforming  and waveform design based on whitening filter . In this paper, we employ similarity constraint in Euclidean norm in waveform design based on matched filter, to control the output envelope effectively. The optimal waveform for maximizing output SINR under similarity constraint is deduced and given in closed form. The remainder of this paper is organized as follows. In Section 2, we present the scheme of OTH radar system employing ESBW strategy, essentially summarized as environment monitoring, characteristics estimating, waveform design, and conventional operation. In Section 3, the waveform design algorithm for optimizing SINR under similarity constraint is developed, and the analytic and optimal solution is obtained as ESBW. In Section 4, a scenario with strong interference and colored noise is simulated as the external environment of OTH radar, by which we investigate the performances of ESBW strategy, and further the evaluation of user parameters. Finally, main conclusions are drawn in Section 5. Cognitive radar constitutes a dynamic closed cycle and emphasizes interaction between illuminating environment (targets, clutter, external interference, and background noise) and radar system (the transmitter, receiver, and signal processor) . The transmitter adjusts the illumination continuously, according to what the receiver learns about the environment. Inspired by cognitive radar, our proposed environmental sensing-based waveform (ESBW) strategy works in a cognitive way, consisting of ‘learning’ and ‘adjusting’ by environmental sensing and adaptive waveform design, respectively. This leads us to the block diagram in Figure 1 which depicts the structures of OTH radar scheme in conventional way [1, 28] and another with ESBW strategy. Block diagrams of OTH radar schemes in conventional way and with ESBW strategy. In conventional way, the frequency management system (FMS) monitors the ionosphere and background surrounding and selects waveform parameters, including operating frequency, bandwidth, pulse length, and repetition period. Then, the transmitter generates predetermined waveform, e.g. the widely used linear frequency modulated continuous waveform (LFMCW), modulates it to the operating frequency and emits high-frequency electromagnetic waves. Each antenna of receive array is configured to a digital receiver whose received data is sent to the high-speed signal processor, including digital beamforming (DBF), matched filter (MF), and Doppler processing basically. Ionospheric decontamination and clutter cancelation are employed for detecting slowly-moving vessels in a long coherent integration time (CIT). Interference cancelation may be involved if necessary, followed by target detection and tracking algorithms in the post-processing stage. As for ESBW strategy, the radar scheme keeps the conventional structure with two exceptions. Firstly, after the FMS selects waveform parameters, ESBW strategy monitors the environment in real time by the receive array, and the designs transmit waveform adaptively based on the sensing results, instead of generating predetermined waveform. Secondly, there is no need of interference cancelation in signal processing (transient interference suppression is not included in ESBW strategy). 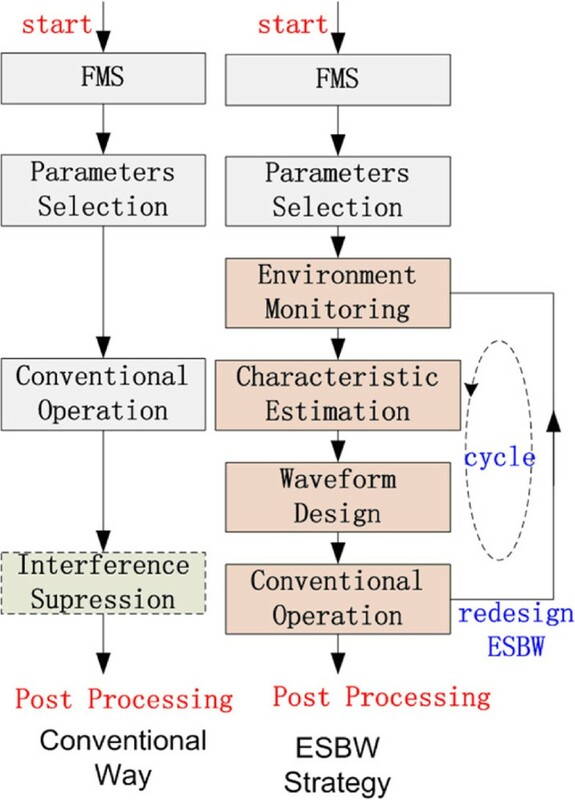 Depending upon the environmental change, ESBW strategy operates in a loop consisting of environment monitoring, characteristic estimating, waveform design, and conventional operation, as described in the following. Environment monitoring collects the environment data for characteristic analysis. To avoid the overwhelming sea clutter, environment monitoring is accomplished under radio silence when the transmitter is cut off. of dimension K×N s , where (·) T denotes the transpose. Herein, there is one principle for evaluating the monitoring time — T s should be as small as possible to reduce its negative effect on the illumination time, under the condition of effectively estimating the statistic characteristic of interference and noise. Otherwise, when T s exceeds a reasonable value, it would not bring significant gain on interference suppression but only reduce the illumination time of OTH radar. Besides, there may be strong transient interference, such as lightning, in OTH radar environment. Transient interference detection algorithms [29, 30] could be employed to examine the data matrix r ~ i . If it is confirmed that r ~ i contains transient interference, radar operators can remove the unwanted samples or simply monitor again. an N s -dimensional vector. R ̂ ( m ) = 1 N s ∑ l = 1 N s − m I ~ ( l + m ) I ~ ∗ ( l ) , 0 ≤ m ≤ N s − 1 , 0 , N s ≤ m ≤ M − 1 .
where R ̂ i = R ̂ i H , and (·) H denotes the transpose and conjugation operation. where s denotes an arbitrary discrete time waveform with norm 1 (see Appendix for details). However, the so-obtained optimal solution to optimization problem (8) probably results in poor properties, e.g. poor range resolution and high sidelobe levels. Generally, radar waveform optimization should consider the characteristics of the solution besides the SINR gain. The proposed waveform design based on MF in this paper has one advantage which is: requirements on mainlobe width and sidelobe levels are equivalent to requirements on ACF. Otherwise, waveform design based on unmatched filter (including whitening filter) needs to consider cross-correlation function (CCF) between the transmit waveform and corresponding filter response. Naturally, we think waveform design based on MF is more manageable than that based on unmatched filter, since the former refers to one factor while the latter refers to two. where ∥·∥ denotes the Euclidean norm, and ε is a user parameter which determines the degree of similarity between the solution and the desired waveform. The optimal and analytic solution to problem (9) is used to evaluate ESBW, denoted as s E . The detailed solution to problem (9) will be provided in Section 3. In conventional operation, OTH radar illuminates the area of interest by EBSW s E and employs the conventional signal processing structure to detect targets. where t n denotes the sample time, N=P × M, and P denotes the number of periods in a CIT. and s E (t n −τ′) denotes the result of waveform s E undergoing lag τ′. In post processing, target detection algorithm (e.g., constant false alarm rate detection algorithm) is employed to examine the detection signal-to-noise ratio (SNR) of delay-Doppler τ ′ , f d ′ cells, followed by data process algorithms, such as target tracking and coordinate registration . min s s R ̂ i s H , s.t. ∥ s ∥ 2 = 1 , ∥ s − s 0 ∥ 2 ≤ ε.
s R ̂ i s H ≥ u M T R ̂ i u M ∗ = Λ M .
Though s = u M T is the optimal solution to problem (8), generally u M T bears wide mainlobe and low peak to sidelobe ratio for a radar waveform. Alternatively speaking, s = u M T dissatisfies the constraint ∥s−s0∥2≤ε in (13) for a reasonable ε. In the following, we will provide the solution to problem (13) for ∥u M T−s0∥2>ε, which resembles a sort of doubly constrained robust Capon beamformer in . min s s R ̂ i s H , s.t. ss H = 1 , ss 0 H + s 0 s H ≥ 2 − ε.
f 1 ( s , λ , μ ) = s − μ s 0 ( R ̂ i + λ E ) − 1 ( R ̂ i + λ E ) · s − μ s 0 ( R ̂ i + λ E ) − 1 H − μ 2 s 0 ( R ̂ i + λ E ) − 1 s 0 H − λ + μ ( 2 − ε ) . s λμ = μ s 0 ( R ̂ i + λ E ) − 1 .
f 2 ( s λμ , λ , μ ) = − μ 2 s 0 ( R ̂ i + λ E ) − 1 s 0 H − λ + μ ( 2 − ε ) . μ = 2 − ε 2 s 0 ( R ̂ i + λ E ) − 1 s 0 H .
f 3 ( λ ) = − λ + ( 2 − ε ) 2 4 s 0 ( R ̂ i + λ E ) − 1 s 0 H .
∂ f 3 ( λ ) ∂λ = 1 − ε 2 2 s 0 ( R ̂ i + λ E ) − 2 s 0 H s 0 ( R ̂ i + λ E ) − 1 s 0 H 2 − 1 ≡ g ( λ ) . z 0 = Us 0 H .
s E s 0 H = 1 − ε 2 . SINR = 1 s E R ̂ i s E H = ∑ m = 1 M | z m | 2 / ( Λ m + λ ̂ ) 2 ( 1 − ε / 2 ) 2 · ∑ m = 1 M | z m | 2 Λ m / ( Λ m + λ ̂ ) 2 . Compute the eigendecomposition of R ̂ i . If the eigenvector u M corresponding to the minimum eigenvalue satisfies the similarity constraint, evaluate ESBW as s E = u M T . Otherwise, continue. Solve the function g(λ)=0 in (27) for λ ̂ . Numeric technique could be involved, e.g. Newton’s method with the differential function ∂ g(λ)/∂ λ given in (25). The initial value for iteration could be chosen as little greater than −λ M . On the contrary, an improper great initial value may lead to invalid value less than the lower bound of λ.
ESBW is achieved by using λ ̂ in (29). In this section, we illustrate the OTH radar scheme with ESBW strategy and analyze the performance of interference suppression. Firstly, a scenario consisting of OTH radar, strong interference, and colored noise is simulated. Then, EBSW strategy is illustrated, step by step. 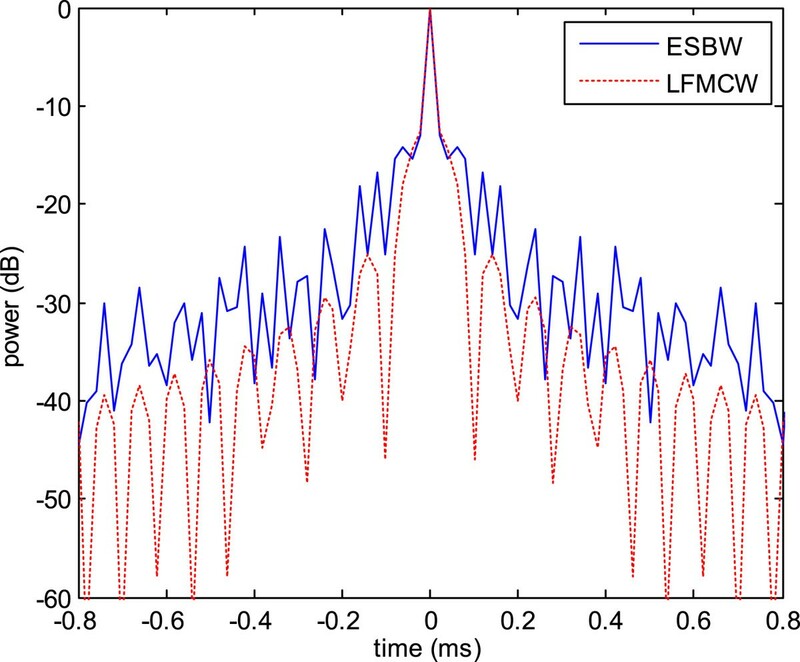 The ACF, power spectrum, and detection SNR of ESBW are investigated, comparing to LFMCW. Finally, user parameters T s and ε are discussed under joint consideration of detection SNR and the ACF. denotes the receiving steering vector for incident angle ϑ.
where rect(·) denotes a rectangular window, rect(t)=1 for t∈(0,1) and otherwise rect(t)=0. And T2 denotes the length of each code unit, A2(n2)=1 or −1 denotes two-phase code, f2 denotes the difference between the center frequency of interference 2 and f c , and ϕ2 denotes random initial phase uniformly distributed in (0,2π). Interference 2 is a point interference with an incidence angle θ2 with steering vector b2=a(θ2). where z−1 denotes the unit delay operator. As colored noise, i3(t) is assumed to extend in wide-scale area. Its receiving steering vector b3 is a K-dimensional vector whose elements’ phases are identically independently distributed (i.i.d. ), uniformly in (0,2π). where n denotes i.i.d. additive white Gaussian noise (AWGN) with zero mean and covariance 1, and α q denotes the complex amplitude of interference. The sum of three types of interference plus AWGN is called environmental noise in the following. 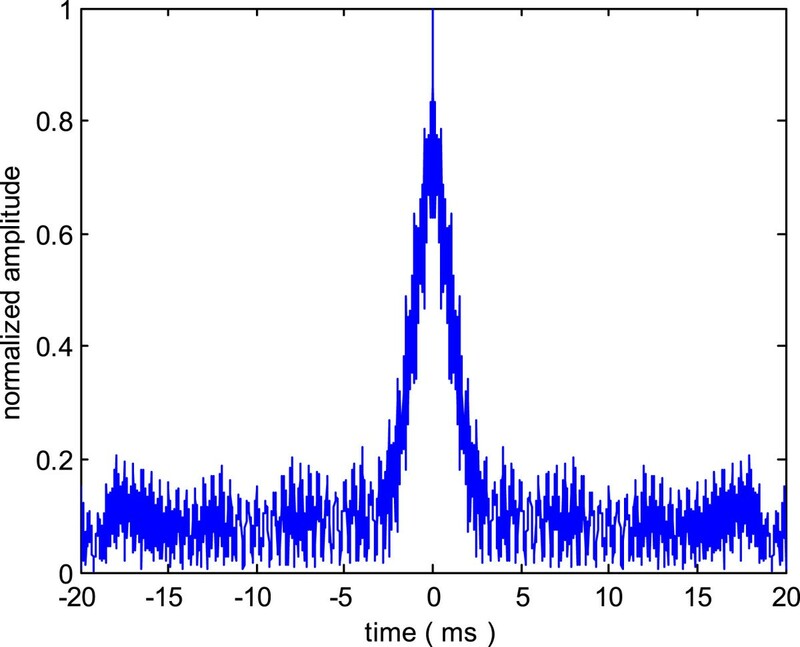 Signal model of environmental noise in (36) applies in two steps: firstly in environment monitoring to simulate monitored samples and secondly in conventional operation to generate the environmental noise component of the received data. In the following simulations, OTH radar parameters are set as f c =10 MHz, B=40 kHz, d=15 m, T=0.02 s, and K=200. Interference parameters are set as β=1011 Hz, f1=−10 kHz, T2=0.002 s, f2=12 kHz, θ1=9°, and θ2=10°. 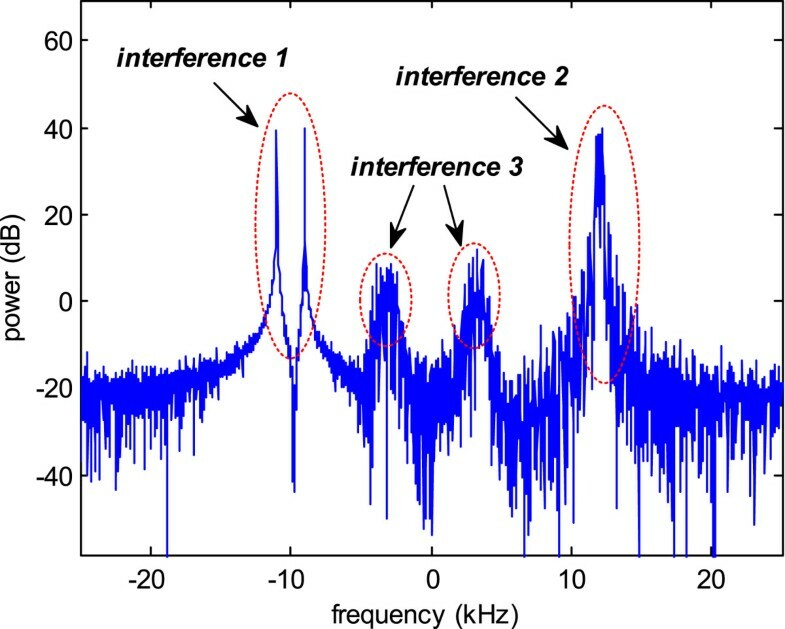 We vary α q to set the interference-to-noise ratios (INRs) of interferences i1(t), i2(t), and i3(t) equal to 0 dB, −10 dB, and 0 dB respectively in each antenna. The environment monitoring time is set T s =0.04 s. Monitoring data matrix r ~ i is simulated by (36). To examine the performance of ESBW on suppressing interference in mainlobe, the interested direction angle is set φ=θ2. Then, beamforming vector w ~ = b 2 ∗ is employed to compute I ~ . Covariance function estimate R ̂ ( m ) is calculated by (5) for T s >T, and then covariance matrix estimate R ̂ i is produced by (7). Normalized covariance function estimate R ̂ ( m ) is depicted in Figure 2. Most energy of R ̂ ( m ) is centralized within 2 ms, an interval much less than pulse length T=20 ms. Generally for improving transmitting energy and range unambiguity in ship detection, OTH radar employs continuous waveform with pulse length larger than 20 ms. It is such a long time beyond which the interference covariance function approximates zero, approaching formula (53). Covariance function estimate of environmental noise (after beamforming), T s =0 . 04. The power spectral density (PSD) estimate of environmental noise is shown in Figure 3. From Figure 3, we can see that the maximum of available clear band is about 10 kHz, much less than B. If employing clear band is insisted, then the sea scatter cell size will be increased significantly, as well as the sea-clutter power. PSD estimate of environmental noise (after beamforming), T s =0 . 04. In waveform design algorithm, similarity parameter is set ε=0.1, and LFMCW with bandwidth B=40 kHz is chosen as the desired waveform s0= exp[j π B t(t/T−1)],0<t<T. ESBW is computed by the waveform design algorithm given in Section 3, based on R ̂ i obtained in the previous subsection. 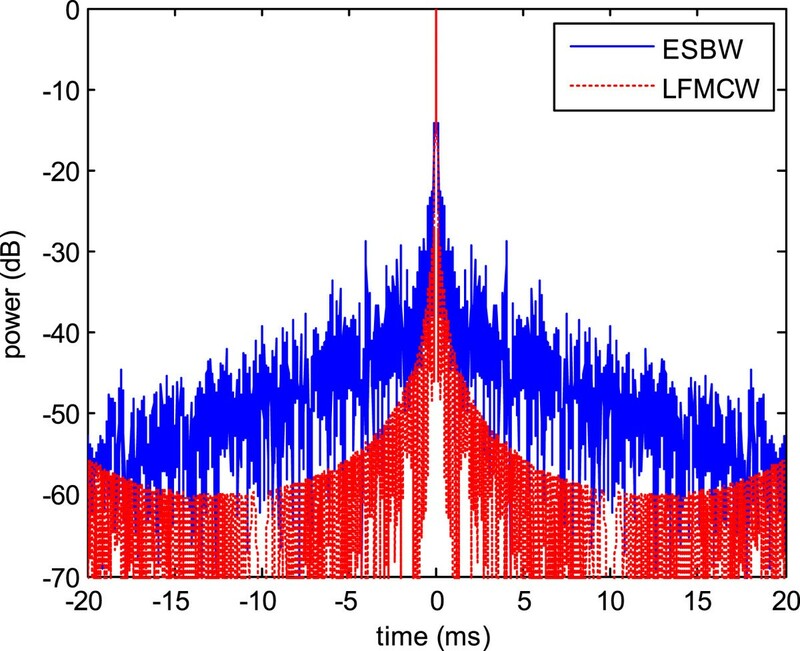 Power spectra of ESBW and LFMCW are depicted in Figure 4, where the thin line and broad line denote power spectra of ESBW and LFMCW, respectively. It can be seen that ESBW concentrates its energy at the spectrum where the power of interference is relatively weak and decreases its energy at the peaks of environmental PSD. ESBW power spectrum has two nulls around −10 kHz corresponding to i1(t), one deep null at 12 kHz to i2(t), and two shallow and wide notches around 0 kHz to i3(t). It reveals that ESBW suppresses interference in frequency domain.The ACFs of ESBW and LFMCW are compared in Figure 5. ESBW bears a reasonable ACF, with sidelobe levels about −30∼−50 dB, worse than LFMCW though. Figure 6 shows that the mainlobe widths of ESBW and LFMCW are close. It implies that ESBW design maintains the range resolution of the desired waveform basically. Hence, the designed ESBW is expected to keep the advantages of wideband LFMCW on broad bandwidth and high range resolution, and retain the sea-clutter power as LFMCW does. Power spectra of ESBW and LFMCW, B =40 kHz, T s =0 . 04, ε =0 . 1. ACFs of ESBW and LFMCW, T s =0 . 04, ε =0 . 1. EBSW sidelobe levels are acceptable, though worse than LFMCW. ESBW maintains the mainlobe width of LFMCW, T s =0 . 04, ε =0 . 1. In this subsection, received data of target echo and environmental noise is simulated when OTH radar employs ESBW to illuminate a target. Then, signal processing procedure is performed to show the range-velocity map and compute the detection SNR. 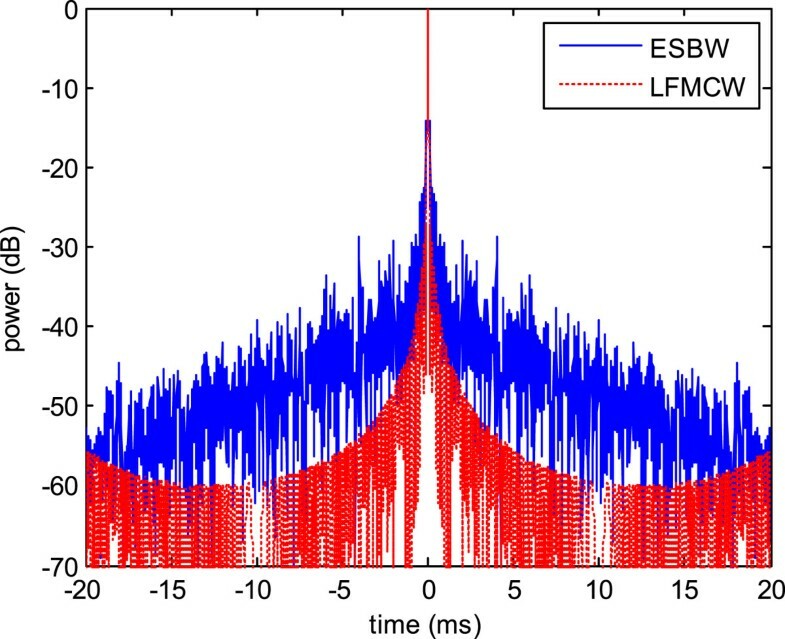 For investigating ESBW’s performance on interference suppression, same simulations are done for LFMCW to compare their results. 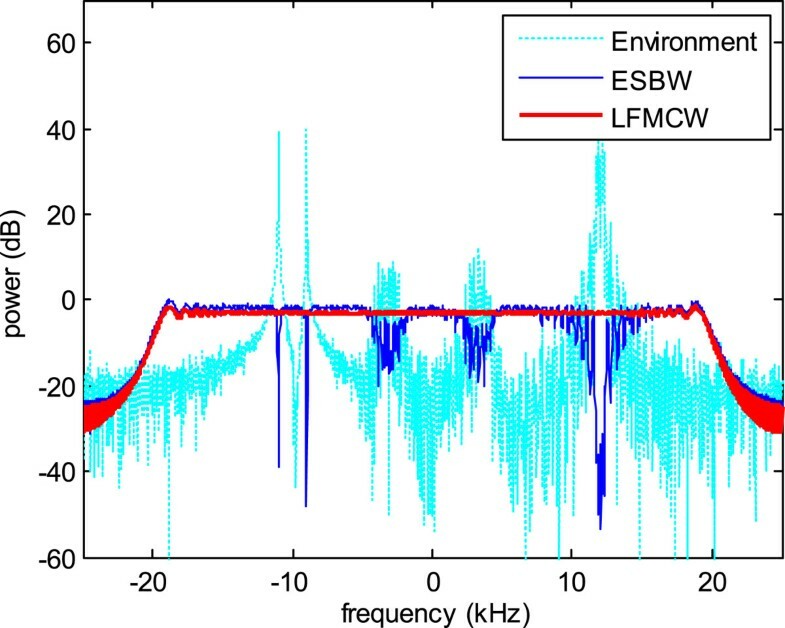 where r ~ i ′ is environmental noise component generated by (35) newly with respect to the monitored data r ~ i , s(t) denotes ESBW or LFMCW, and α t denotes the complex amplitude of target echo. In the following, we set P=200 and vary α t for SNR =−55 dB in each antenna. In signal processing, weighting vector w = b 2 ∗ is employed for receive beamforming, s0 and s E for MF, and FFT method for Doppler processing. 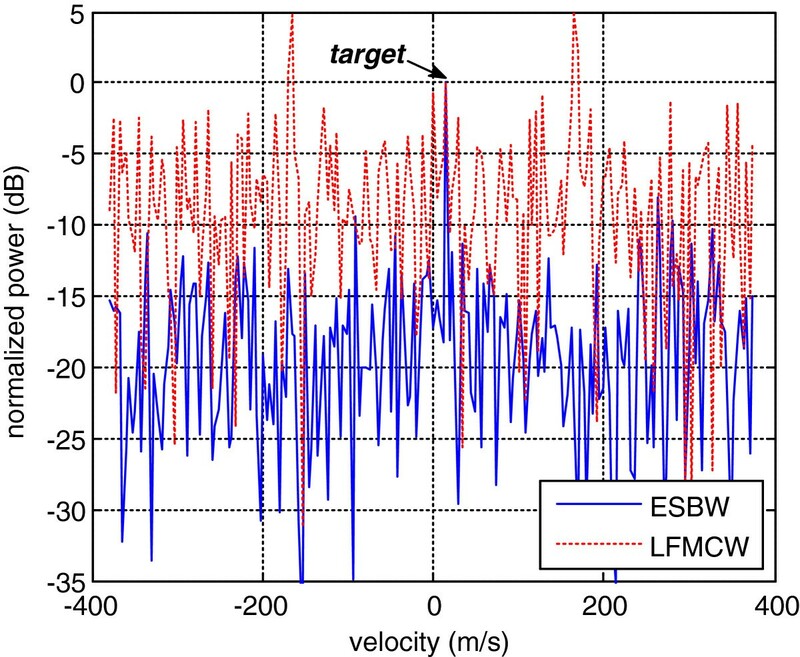 The results in range-velocity map for LFMCW and ESBW are shown in Figures 7 and 8. In Figure 7 for LFMCW, two continuous peaks at velocity ±165 m/s, which are produced by interference 1 due to the ambiguity Doppler frequency. The normalized power of target cell is −5 dB, so that the target is undetectable. Besides, there are many lower peaks distributed in mess all over the range-velocity map, owing to interferences 2 and 3. 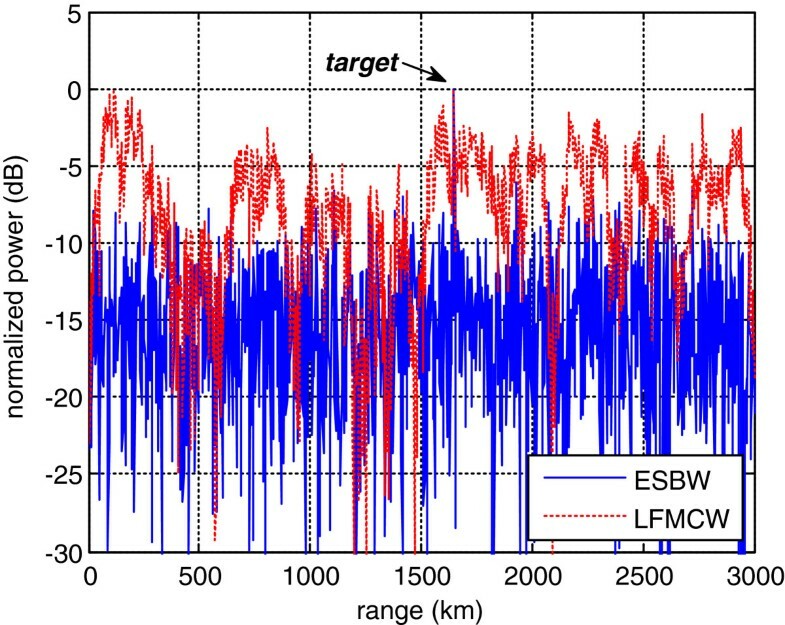 However, in Figure 8 for ESBW, the peaks produced by interference are canceled, and the target is visible. Range-velocity map employing LFMCW. A target is located at R t =1650 km with velocity v t =15 m/s, and P=200. 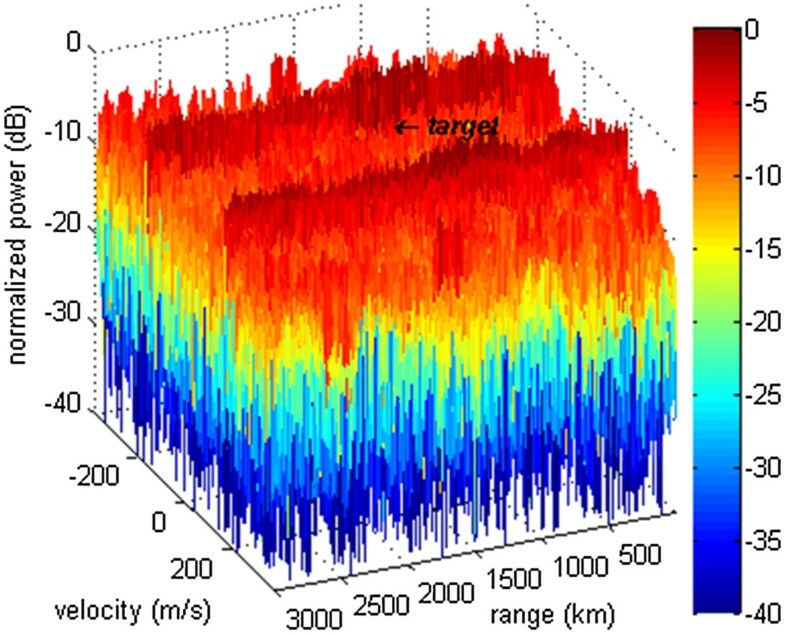 Range-velocity map employing ESBW. A target is located at R t =1650 km with velocity v t =15 m/s, and P=200. For detailed investigation, Figure 9 depicts the power along the range dimension at velocity 15 m/s, normalized with respect to the range cell where the target exists. The dashed line denotes LFMCW while the solid line denotes ESBW. We can see that the dashed line spreads over −10∼0 dB in all the range cells while the solid line gets a peak at the range of 1650 km with others mainly −10 dB below. By employing cell-averaging constant false alarm rate (CA-CFAR) detector (cells of the same range or velocity are excluded), the calculated detection SNR of ESBW is 15.4 dB, which implies that the target is detectable. 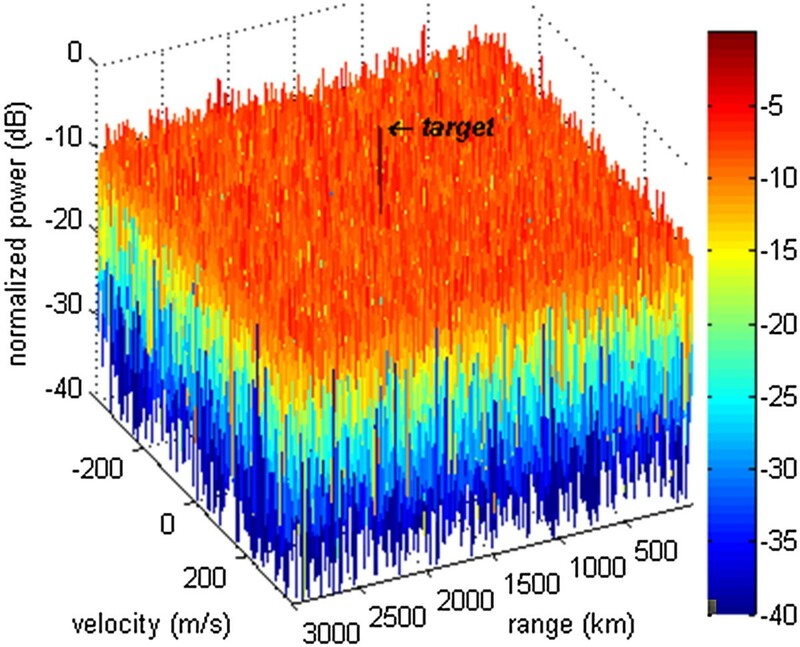 Similarly, Figure 10 depicts the power along the velocity dimension at the range of 1650 km, normalized with respect to the power of the velocity cell where the target exists. 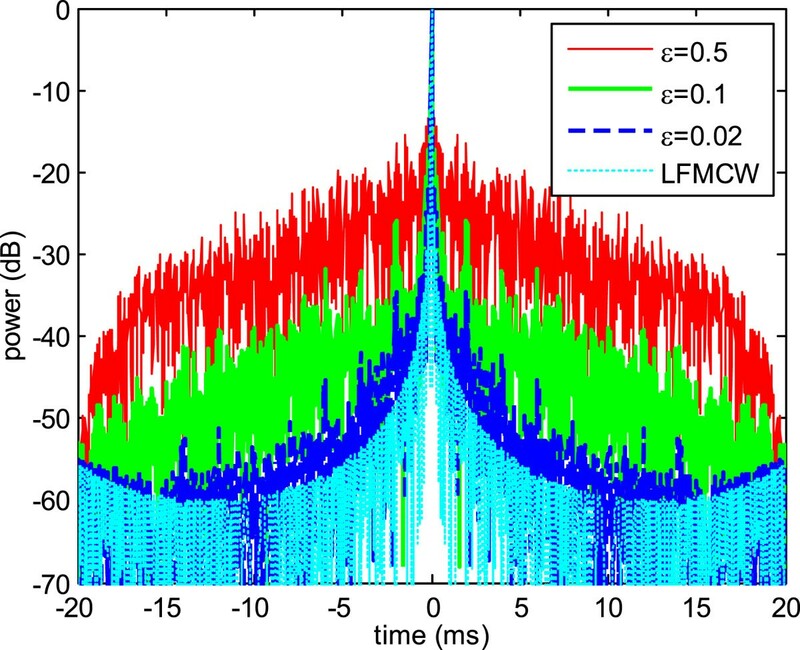 For LFMCW, there are two peaks at velocity ±165 m/s produced by interference 1 as a result of Doppler ambiguity. Many lower peaks exist in other velocity cells, owing to i2(t) and i3(t). However, there is only one peak corresponding to the target velocity for ESBW. The peaks of i1(t) are canceled and those of i2(t) and i3(t) are suppressed to −10 dB around and below. Power along range dimension at target velocity cell, normalized by the amplitude of target range cell. Power along velocity dimension at target range cell, normalized by the amplitude of target velocity cell. Simulation results demonstrate that OTH radar employing ESBW achieves significant SNR improvement compared to LFMCW and detects the target successfully in the presence of strong interference. Recollect that the target echo and interference 2 share the same incidence angle θ t =θ2, and the steering vector of interference 3 is randomly produced. It illustrates that ESBW can suppress the interference from the mainlobe and colored noise without a clear incidence angle. In the proposed ESBW strategy, there are two user parameters: monitoring time T s and similarity degree ε. Their effects on ESBW performance are important and worth investigating. In the following, detection SNR of ESBW strategy is simulated for various evaluations of T s and ε, with radar and environmental parameters set the same as previous subsections. Figure 11 depicts the statistical results by 2000 Monte Carlo simulations. It is worth noting that the detection SNR is about 17 dB when all three types of interference are absent in the environment (only AWGN), and ε=0 denotes LFMCW. Detection SNR of ESBW strategy versus T s and ε , where ε =0 denotes LFMCW. Favorable SNR (>15.5 dB) is achieved for ε∈ [ 0.05,0.5] and T s ≥0.02. Firstly, observe the dependence of SNR on monitoring time T s . It can be seen in Figure 11, SNR rises with T s mostly, for ε in 0.005 ∼0.5. It is plain to see the reason that increasing monitoring time T s is good for EBSW design, since the environmental characteristic is better estimated. However, there is a reasonable value for T s . Three lines behave similarly for T s = 0.02, 0.04, and 0.1. Favorable SNR (>15.5 dB) is achieved for T s in 0.02 ∼0.1 and ε in 0.05 ∼0.5. It reveals that T s greater than 0.02 s does not bring noticeable effect. The monitored data sampled in 0.02 s gives enough information of environmental noise to support favorable result for ESBW design. 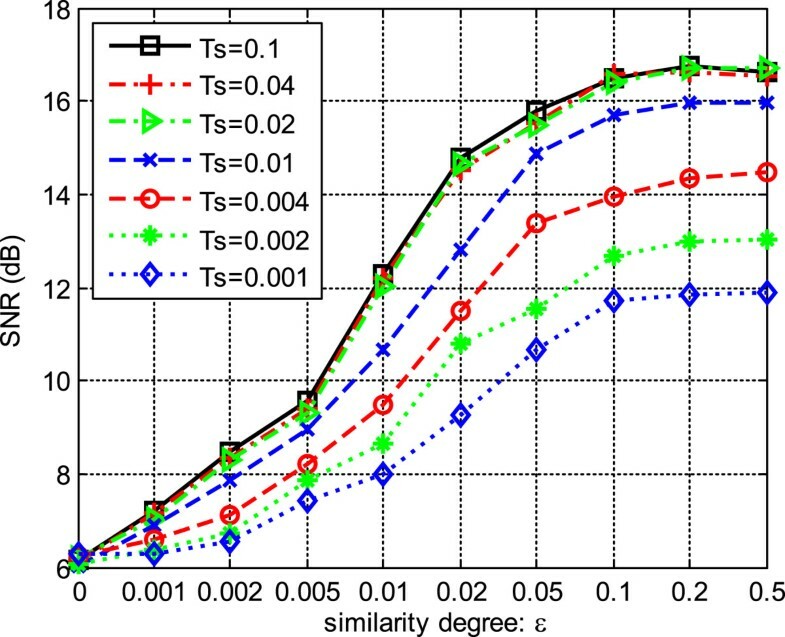 It is unlikely to obtain significant SNR improvement by increasing T s once T s exceeds 0.02 s.
Secondly, observe the dependence of SNR on similarity degree ε. It can be seen that mostly, SNR grows along with ε, since greater ε broadens the range of waveform design. However, SNR almost remains unchanged as ε grows after 0.1, unlike the theoretic SNR gain increasing with respect to ε monotonically in (31). Figure 12 shows the power spectrum of ESBW for ε= 0.02, 0.1, and 0.5, T s =0.04. In Figure 12, as ε grows, the power spectra of ESBW matches the PSD of environment noise better, with deeper and wider nulls and more detailed amplitude adjustment. However, greater ε means that ESBW differs more from the desired waveform. Accordingly, for growing ε, the ACF bears higher sidelobe levels which would degrade the output SNR of moving MF, as shown in Figure 13. Besides, the AWGN cannot be suppressed, though the estimated covariance of AWGN is not an identity matrix and seems to allow the possibility. Power spectra of ESBW, for ε =0 . 5,0 . 1,0 . 02, B =40 kHz, T s =0 . 04. ACFs of LFMCW and ESBW, for ε =0 . 5,0 . 1,0 . 02, T s =0 . 04. At first glance, Figure 11 shows that SNR improvement can be enhanced by increasing T s or ε alternatively. However, there are compromises in both ε and T s evaluation, for the sake of reasonable ACF and conventional operation time for OTH radar. Herein, the reasonable advice is to locate T s in 0.02 ∼0.1 s and ε in 0.05 ∼0.2, to achieve desirable SNR improvement and ACF, as well as least reduction of radar operation time. It is worth noting that the reasonable evaluations of T s and ε may vary for different environmental noise and radar system parameters (pulse length and bandwidth, etc.). Basically, it is concluded that reasonable monitoring time could be short for steady interference, and great similarity degree ε is needed for severe occupation by interference. Therefore, OTH radar employing ESBW strategy prefers to take channels occupied by steady interference with narrow bandwidth. This paper considers the problem of OTH radar employing wideband signal for ship detection in wanted bands occupied by cochannel interference. A cognitive waveform design method called ‘ESBW strategy’ is proposed, with several advantages or points as follows. (a) Waveform design is adaptively based on environmental sensing in real time, so ESBW strategy performs a cognitive cycle and works in the presence of non-stationary interference. (b) ESBW strategy is capable of detecting targets and suppressing interference from mainbeam direction or extended sources, by traditional receive beamforming, pulse compression (matched filter), and Doppler processing, in no need of extra interference cancelation algorithms. (c) Transmit waveform is optimized to maximize the SINR at the output of matched filter, under similarity constraint for desired range resolution and reasonable sidelobe levels indirectly. (d) The optimal solution to this constrained optimization is derived in closed form, so that the waveform design algorithm’s convergence and efficiency is guaranteed. Numerical examples demonstrate that ESBW strategy suppresses interference successfully, achieves significant SINR improvements, and maintains the same range resolution essentially, compared to the widely used linear frequency modulated waveform. Herein, we prove that waveform design based on the criteria of maximizing the output SINR of array signal processing can be formulated as optimization problem in (8). where t n denotes the sample time, s t (t n ) denotes the received target echo, and r i (t n ) denotes environmental noise, including interference and additive noise. where Q denotes the number of interference, i q (t n ) denotes the q th interference (colored noise as well), and row vector b q contains the amplitudes of interference i q (t n ) at K antennas. Suppose that additive noise is spatial and temporal white Gaussian noise with zero mean, so n(t n ) is a K×P M matrix with elements identically independently distributed. x ( t n ) = w · r ( t n ) . y τ ′ , f d ′ = wa T ( θ ) · α t ∑ p = 0 P − 1 e j 2 π f d − f d ′ pT s ( t n − τ ) s H ( t n − τ ′ ) + wr i ( t n ) · s Ft H t n , τ ′ , f d ′ . P t = | wa T ( θ ) | 2 · | α t ∑ p = 0 P − 1 e j 2 π f d − f d ′ pT | 2 · s ( t n − τ ) × s H ( t n − τ ′ ) 2 . P i = s Ft t n , τ ′ , f d ′ · E I H I · s Ft H t n , τ ′ , f d ′ . R P = E I H I .
SINR = P t / P i = | wa T ( θ ) | 2 · | α t ∑ p = 0 P − 1 e j 2 π f d − f d ′ pT | 2 · | s ( t n − τ ) s H t n − τ ′ | 2 s Ft t n , τ ′ , f d ′ · R P · s Ft H t n , τ ′ , f d ′ . SINR = | wa T ( θ ) | 2 · | α t ∑ p = 0 P − 1 e j 2 π f d − f d ′ pT | 2 · s ( t n − τ ) s H ( t n − τ ′ ) 2 P · s ( t n − τ ′ ) R i s H ( t n − τ ′ ) . SINR = | wa T ( θ ) | 2 · P α t 2 · s s H 2 s R i s H .
min s s R i s H , s.t. ss H = 1 . R i ( m ) = E I ( l + m ) · I ∗ ( l ) , 0 ≤ m ≤ M − 1 .
where I(l) denotes the l th element of I. Then, covariance matrix R i is obtained by arranging R i (m) like (7). Obviously, R i is a Toeplitz matrix and R i = R i H .
As two-order characteristic property of time-varying environment noise, R i is generally thought to be unknown. Herein for the optimization problem in (56), covariance matrix estimate R ̂ i is used instead of R i . Based on environment data collected in step ‘environment monitoring’, covariance function estimate R ̂ i ( m ) is obtained by (5) or (6), and then covariance matrix estimate R ̂ i is achieved by (7) in step ‘characteristic estimating’. By replacing R ̂ i with R i in (56), the optimization problem is formulated as (8). This work was supported by the National Nature Science Foundation of China under Grants 61032010 and 61102142 and the cooperation foundation between Nanjing Research Institute of Electronics Technology (NRIET) and University of Electronic Science and Technology of China (UESTC).